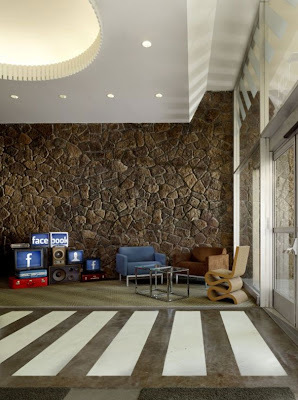 Employees of Facebook recently moved to a new headquarters that facilitates interaction and connection, reflecting the company’s mission as a social networking website provider. 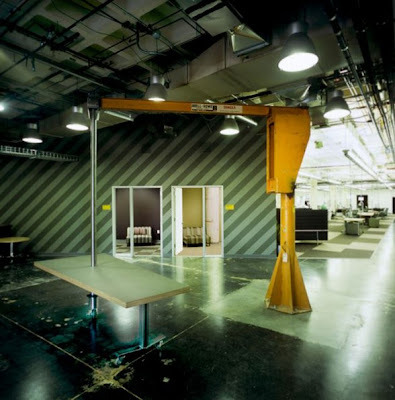 Formerly a laboratory facility for high-tech manufacturer Agilent Technologies, the 150,000-square-foot structure at Palo Alto’s Stanford Research Park brings together more than 700 employees originally scattered throughout 10 locations in and around downtown Palo Alto. 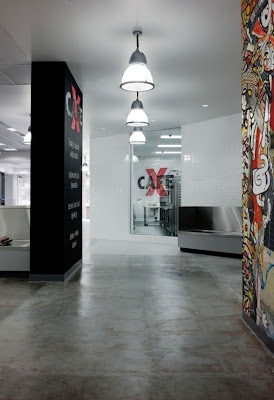 The design of the space relied heavily on input from the users, appropriate for a flatly structured company that weights every employee’s opinion equally. O+A designers interviewed employees about what they wanted from their new headquarters. The Facebook platform was used to conduct company-wide polls about design decisions, post construction photos and updates, and keep everyone informed of the thought process behind the project. An advisory board of employees from every department collaborated with the design team on the design process, from space planning to finishes to final move coordination. 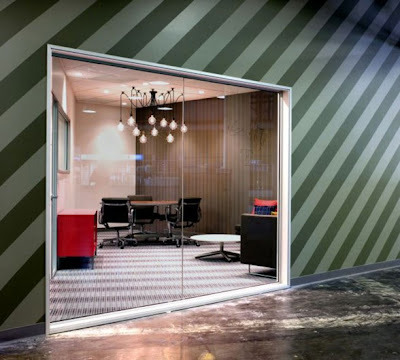 Because the new facility houses employees coming from various locations, the company wanted to maintain each division’s distinct identity. 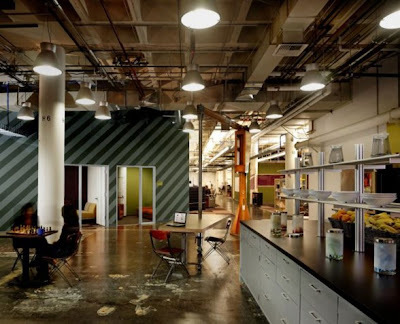 The design takes its inspiration from the patchwork nature of Facebook users and employees, bringing together seemingly disparate elements to form a cohesive pattern and using color and interior spacing to create neighborhoods within the open plan space. 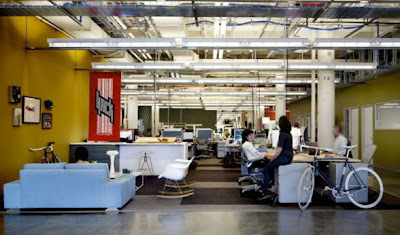 The company’s executives sit in central areas, accessible to all employees. 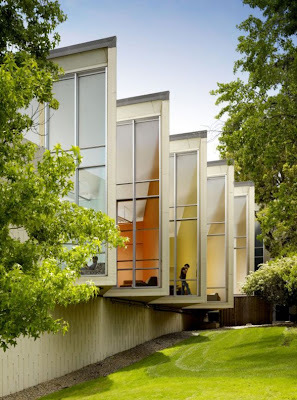 Large lounges and open spaces provide venues for the community to come together. 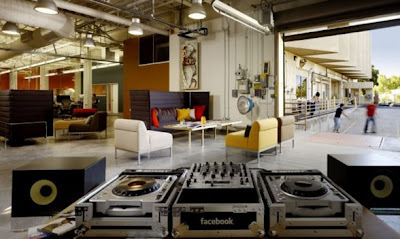 A kitchen and café continue Facebook’s tradition of providing gourmet meals to staff at all hours, while drinks and snacks are available at micro-kitchens throughout the headquarters. 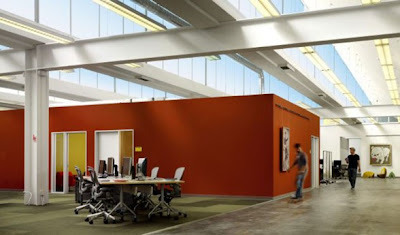 Reflecting employees’ desire for a green headquarters, the facility is the first commercial project completed under Palo Alto’s 2008 Green Building Ordinance, making extensive use of existing architectural features, recycling millwork from the original lab, and repurposing industrial components for post-industrial use. 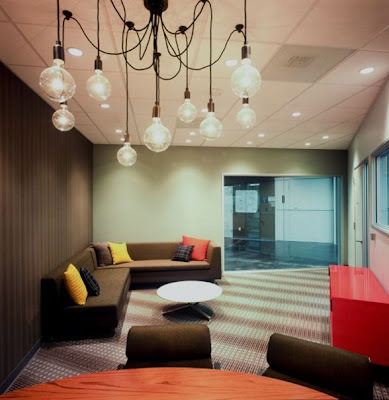 Other sustainable features include high recycled-content carpet and energyefficient lighting. 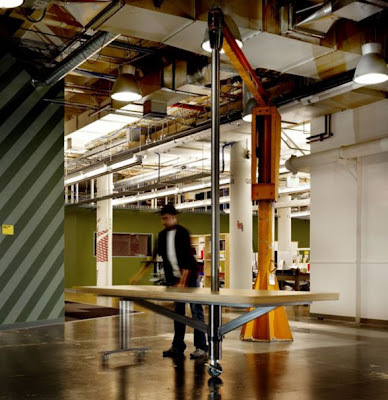 A bright orange industrial crane, left over from the building’s previous user, was repurposed by San Francisco sculptor Oliver DiCicco to support a table surface from its heavyweight hoist, offering maximum maneuverability. 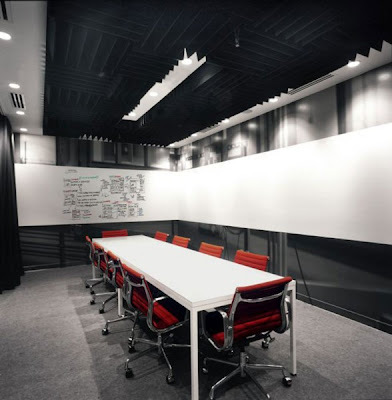 Referencing the industrial aesthetic of the building, a felt canopy spreads up one wall and onto the ceiling, defining a central meeting area that can double as an impromptu auditorium. Mounted on threaded rods of varying length to achieve an undulating effect, the canopy absorbs sound and is penetrated at intervals by overhead lighting. An outdoor basketball court and indoor ping-pong table offer opportunities for recreation. 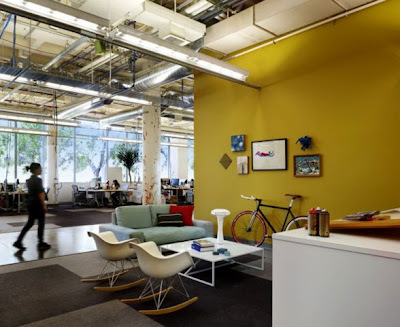 And it is not unusual to see employees zipping along the concrete floors on two-wheeled skateboards.